» Win Tickets to Pinkalicious The Musical in Albany! Home » Contest » Win Tickets to Pinkalicious The Musical in Albany! Win Tickets to Pinkalicious The Musical in Albany! If you have a young one in your life, you have probably heard of Pinkalicious. (She is a huge hit in our house!) I was very excited to learn that “Pinkalicious the Musical” will be coming to the Palace Theater in Albany next month! 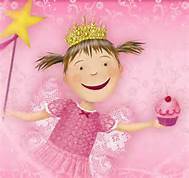 This is the tale, based on the popular book by Victoria Kann and Elizabeth Kann, of Pinkalicious, who can’t stop eating pink cupcakes despite warnings from her parents. Her pink indulgence lands her at the doctor’s office with Pinkititis, an affliction that turns her pink from head to toe – a dream come true for this pink loving enthusiast. But when her hue goes too far, only Pinkalicious can figure out a way to get out of this pink predicament. Pinkalicious is about learning self-control and the importance of moderation. This fantastic new musical, to be produced on The Palace stage by Albany’s Park Playhouse, will teach students the power of nutrition and leading how leading a healthy life can still be cool. Would you like to WIN tickets to see it?? I am pleased to be giving away a FREE family four-pack of tickets to this event! That’s it! Once your comment is approved, you are entered to win! Winner will be randomly selected using the “And the Winner is….” plug-in after 9 PM on Tuesday, November 4th. Winner will be notified via email. Stayed tuned for more giveaways…. I would take my three year old twins! My daughter would wear all pink in honor of pinkalicious!! She would love it! I Would take my 3 kids: ages 7 year old and boy/girl twins 4.5 years old! They would love it Nd I would love for them to learn about self control!! I would take my PINKALICIOUS grandaughter! She is 6 and loves her! I would take my niece! She would love this. We read the books all the time! I don’t think my entry went through the other day. Oops! I would take my daughter and her friend! I would take my 3 year old granddaughter! We have read several books and she loves them!! I would love to take my daughter. Those were the only books she would read. Me and my husband would take my 6year old and 3year old daughter..It would be perfect because it’s there Birthdays in November. I would take my daughter, her friend and mom. The girls are learning to read and pinkalicious books are there favorite!! I would take my daughter and my two nieces! My daughter loves Pinkalicious! I would take her, my niece and my sister-in-law. I would love to take my niece and her best friend! I would take my twin 3yr old girls. My 2 girls would LOVE this show!! I wOuld take my daughter…we read the book at least twice a day!! I woukd take my girls!! Would love to bring my 3.5 yr twins + hubby! I would take my daughter, son, and hubby! I would bring my best friend and our five year old daughters! Would be psyched to win and would bring my almost 4 year old daughter, hubby and mom! I would love to bring my 2 kids but especially my almost 3yr old who is definitely in. Me my way phase! Would love to take my 3 girls!! I would take my daughter and niece!